This is a short-ish story about how the word spreadsheet led to wedding bells. That profile belonged to Mr. Hungry, and one day he messaged me! After a few more tasteless and overly aggressive messages from several OkCupiders in the subsequent weeks, I was ready to delete, not deactivate, my profile for good. Basically, he kept a spreadsheet for dating* to identify “terminal nodes” (why communication/first date/etc. ended) and adjusted his behavior accordingly. I love spreadsheets. It was the one word in his message that caught my eye and gave me a beacon of hope for online dating. A few messages later, we were set for our first dinner date. 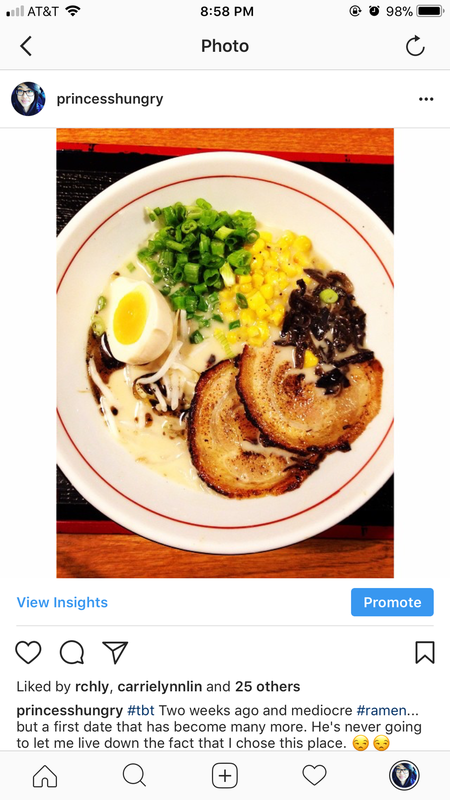 What the ramen lacked in flavor, the company and conversation more than made up for it. We ended up going on 6 dates in the first 12 days of meeting each other. So that’s how I met Mr. Hungry. And now we’re married and coming up on our 3rd (dating) anniversary thanks to the word spreadsheet. There is only so much I can cram into my brain before I start walking out the front door without pants on. Seriously. So, to prevent my neighbors from thinking I’m a crazy lady, I’ve built systems (over time) to serve as a second brain to store information that is easily retrievable and actionable. Catch-all app for thoughts/ideas/articles/photos/chicken scratch/kitchen sink. Reminder function to come back to above items and make it an actionable item or tag and file away for another time. A balance of something physical (handwritten things stay in my brain so much better) and something portable to serve as a digital second brain I can easily search and file information. Enter stage right: EVERNOTE AND ASANA! In Evernote I use Stacks, Notebooks, and Tags to wrangle #allthethings. Every few weeks I make a point to schedule a reminder to go through items I tag as “To File and Sort” so I actually make the time to file and sort them accordingly. Surprisingly this doesn’t take up as much time as you might think. I also utilize tags for different categories of my website such as ‘social media’, ‘newsletter’, ‘content’ when I am saving items in “To FIle and Sort”. This helps remind me what I was originally thinking about using the piece for when I saved it. PrincessHungry - I keep 6 notebooks in this stack (Content Creation, Cookbook Notes, Newsletter, Social Media, Legal, and a general PH notebook) - Maintain templates for organizing blog posts and tracking ideas for content. As templates get filled out I review and prioritize what makes it into production in Asana. Ax Sharpening - Online courses: As I’m working on different sections of a course I keep a running list of to-do items or things I’d like to add to my website. Periodically, I review this list and prioritize which ones make it over to production in Asana. - I keep a running list of articles and books to read that are recommended by friends or members of several Facebook groups I participate in. One of my goals is to read more books published by women and POC in 2018! Reminders to revisit thoughts/ideas/etc. is absolutely key to making wishes into goals… into reality. Project Management/Editorial Calendar/Daily Tasks Manager to GSD = ASANA!!! After many years of running my life with Trello, I made the jump to Asana because there were just SO many moving parts for each cookbook. I really needed a master task list view instead of a calendar view when planning my tasks. The calendar view, however, is clutch for my editorial calendar and getting a good visual of how my time is allocated so it’s not overwhelming. Sections within each cookbook project include reading blocks (breaking up each cookbook into digestible (pun totally intended) chunks), the entire food photo shoot and styling process (including recipe selection, grocery shopping, etc), and social media content. I also keep a running list of things to do/add to the site that I’ve reviewed, filtered, and prioritized from an Evernote notebook. Current Favorite Features of Asana? Accountability - Even though all the tasks are mine (woohoo, one-woman show! ), something about assigning a task to myself makes me more likely to DO it. Google chrome extension that allows Asana directly into your gmail to create tasks from your emails! What do you use to wrangle all your content and GSD? What have you found works best over time? Y'all. One of my favorite holidays is just around the corner! And this year, I'm taking over cooking duties from my mom. #adulting It's going to be a busy week of prep, cooking, and eating. SO, next week I'll be spending the time with my fam bam. Posts will resume the Monday after Thanksgiving. *Surprisingly, (not surprisingly?) someone else has done something similar. You can listen to her TED Talk here.